“Hope is what drives the hearts of those who depart,” said Pope Francis on 27 September last year as he opened the Caritas/CAFOD Share the Journey campaign on migration. 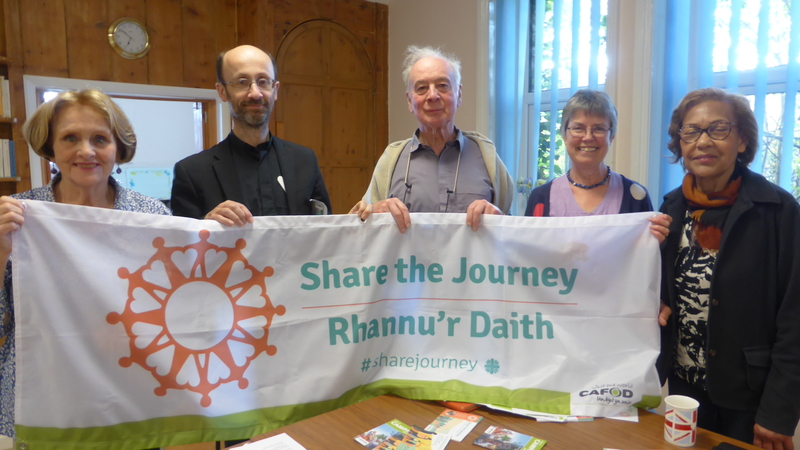 These are the exact sentiments which prompted parishioners, lead by long-standing volunteer, Stuart Harper, from St David’s Priory Church in the centre of Swansea to reach out and organise their own Share the Journey walk and to try to make a positive difference to everyone with experience of migration. 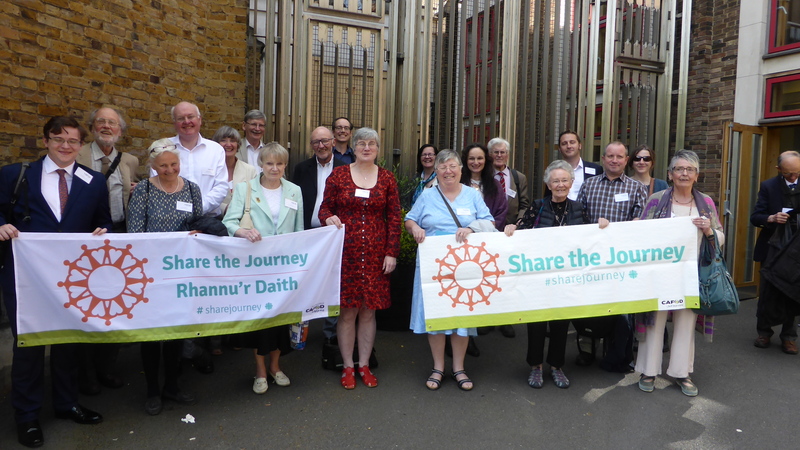 We are delighted with the response to the Share the Journey campaign from the parishes around the Archdiocese. The campaign has gathered enough momentum to have already reached its initial target of walking around the world: 24,900 miles. We are hoping that this will get the attention of world leaders… please consider lobbying your MP. We have a very useful and powerful scheme for MP Correspondents – people around the country who undertake to write to their local MP – a couple of times a year – to try to influence them to act on behalf of the world’s poorest people. Will you join us? So now we are embarked on a SECOND walk around the world! Since writing this we have already walked three times around the world in solidarity with our brothers and sisters. We are now trying to make it a fourth time…. Please continue to respond to Pope Francis’ call for us all to to act in solidarity with refugees and migrants. 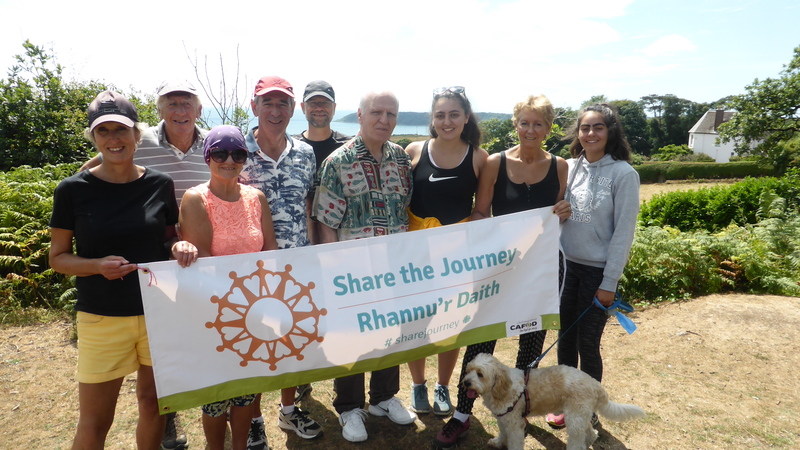 And getting involved in the Share the Journey campaign is just one way in which we can all respond. So please sign up to add your voice to this important campaign which is lobbying the UK government to play a leading role when the United Nations agree new global agreements on the rights of refugees and migrants in September this year. We are praying, walking, signing cards and lobbying our MPs to ask that these agreements are compassionate, respectful of human dignity and keep families together. So it’s an enormous thank you to the parishes who have already taken part by organising petition card signings or Share the Journey parish walks. It’s easy to sign the petition online. And there’s plenty of time for your parish and/or parish groups such as a Justice & Peace group, UCM, CWL or SVP, Catenians, etc to get involved…. Here is a list of upcoming parish walks which anyone is welcome to join. Why not invite a friend along too? The list will be updated with every new walk that is added and please don’t forget to let us know how you are getting involved. Sunday 15 July – St Helen’s RC Church, Nantgarw Road, Caerphilly CF83 3FB. Leaving St Helen’s church at 2.30 pm to walk around Caerphilly Castle. Wednesday 18 July – St Mary’s RC Church, Edith Road, Dinas Powys, Cardiff CF64 4AD. Leaving the church at 6.30 pm. Saturday 21 July – St David’s Priory Church, St David’s Place, Swansea SA1 3NG. Meet at the Beaufort Arms, Kittle at 9.45 am for a prompt 10.00 am departure. 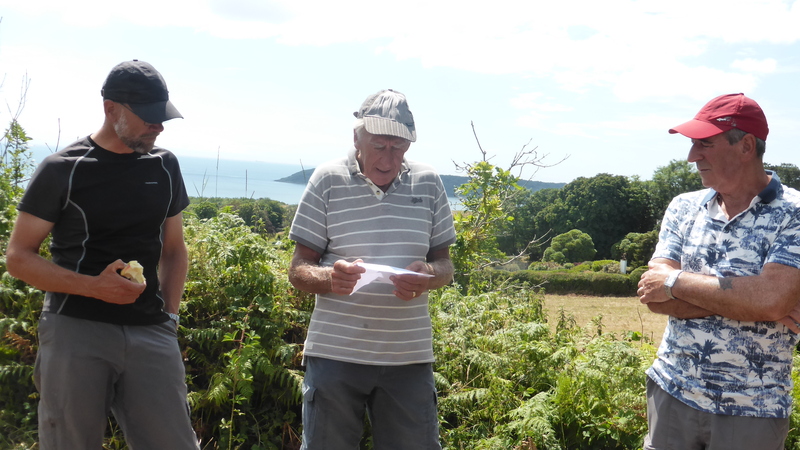 This is a social walk around the Gower of 11 miles but with an option to complete one section of 5.5 miles (phone Ben on 07967 077002 for details). Gower terrain, walking shoes, trainers are fine as long as the good weather persists. Please bring snacks, plenty to drink and a packed lunch which we will share at the viewpoint of Penmaen. Finish back at the Beaufort arms at around 4.30 pm. Thursday 26 July – Holy Cross, Heol y Bryn, Pontyberem, Carmarthenshire SA15 5AG. Walk at 6.30 pm along Kidwelly Quay. About 3 mile walk. Meet at Grid Reference: SN398064, the main car park at Kidwelly Quay. Saturday 11 August – Holy Name, Fishguard and St Michael’s in St David’s – Start from Caerfai Bay car park postcode SA62 6QS at 3 pm. Walking 2 miles to St Non’s Retreat Centre where the Nuns have kindly offered to provide us with a cuppa! Then back to the car park at Caerfai Bay. Sunday 19 August – St Michael’s Church in Brecon LD3 9AB. Meet at the church to start at 3 pm. Accessible walk. Sunday 9 September – Our Lady, Queen of Martyrs Church, 101 Belmont Road, Hereford HR2 7JR. Walking around Our Lady’s RC Primary School field, immediately after the 9.30 am Mass. Friday 21 September – Our Lady & St Michael RC Church, 10, Pen-y-Pound, Abergavenny, NP7 5UD. Time to be confirmed. 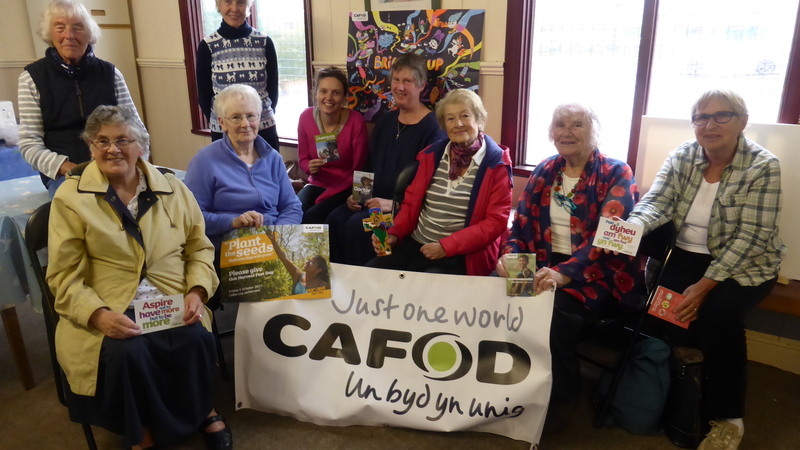 You can find out more about CAFOD’s work with refugees here. And at Harvest, we share God’s abundance with our neighbours. 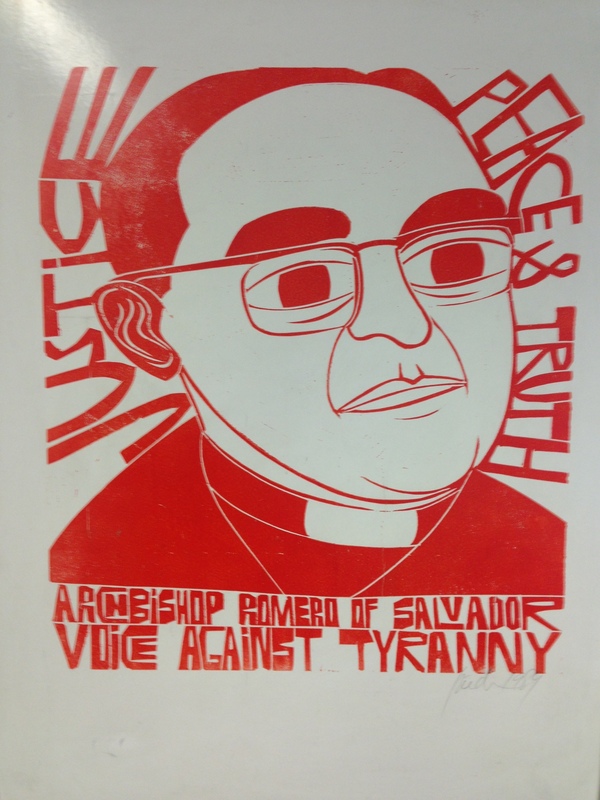 This Harvest Fast Day we draw inspiration from the Oscar Romero prayer which will be in all the Fast Day packs. 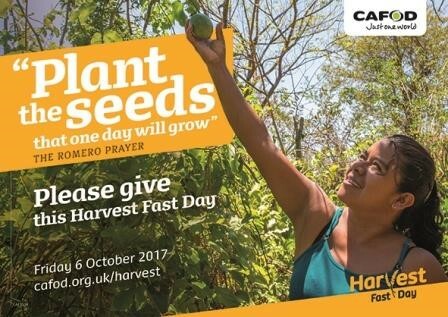 If your parish is holding a Harvest Fast Day collection, the pack will be with all parish priest and parish volunteers in the first week of September. On the last evening in May (Wednesday 31), the stage was set for International Hustings in Swansea at St Mary’s Church. The event was jointly organised by the Welsh Centre for International Affairs and the Church in Wales and was chaired by the Rt Revd John Davies, Bishop of Swansea and Brecon. 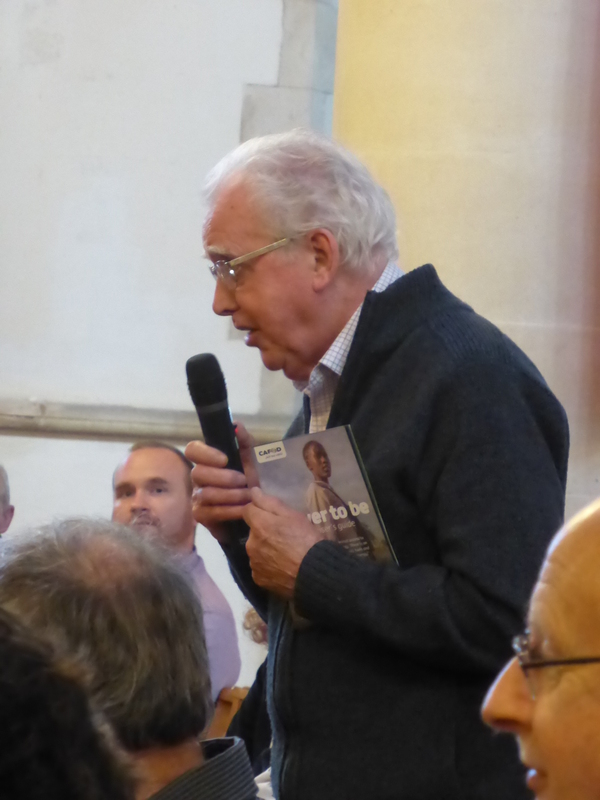 It was an opportunity for our campaign volunteers from CAFOD to question representatives from the main political parties about key international issues within the remit of Westminster and the UK government.